When they first distributed these books to the children and staff of the deaf school, the most bizarre thing happened. At a certain point everyone started crying. I could not understand this reaction.. . . Americans are somewhat used to the idea of positive reinforcement. . . . Not so in China and particularly not for these children who are virtually abandoned and considered valueless by their natural parents because they were born “broken.” When the idea came through in the reading that they are special simply because they were made by a loving creator . . . everyone started crying—including their teachers! It was wild. Why does he love you so much? The same reason the artist loves his paintings or the boat builder loves his vessels. You are his idea. And God has only good ideas. “For we are God’s masterpiece. He has created us anew in Christ Jesus, so we can do the good things he planned for us long ago” (Eph. 2:10 nlt). Fear, mismanaged, leads to sin. Sin leads to hiding. Since we’ve all sinned, we all hide, not in bushes, but in eighty-hour workweeks, temper tantrums, and religious busyness. We avoid contact with God. If you are looking for an inspiring, easy read that is theologically sound – Max Lucado can’t be beat. 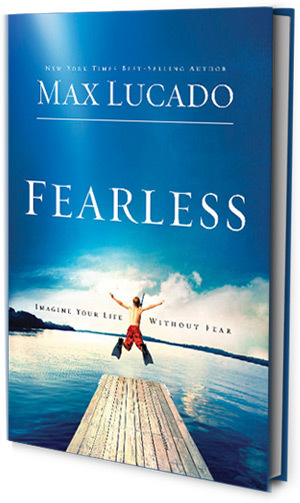 Fearless is a good book to reconnect you with the basic principles of being a child of God. I recommend it. I don’t care what anybody says, Lucado is the man. That he is. I found him to be a good read.